If you read my friend Weaselmomma’s blog, World of Weasels, you know that this week she completely lost her mind and added a mastiff puppy to her brood of five children, a couple of cats, a non-human rodent or two (I lose track: we recently lost Gimpy and Tenderfoot…), a couple of frogs, and lord knows how many other animals that are there in that house that I haven’t even seen yet in the many times I’ve been over there. But I get it. I’m a total dog person and I adore puppies (can’t wait to meet that little peeing-in-the-kitchen-half-the-time-but-getting-much-better darlin’), so going gaga over one is not a foreign idea to me. In fact, I plan to live vicariously through her during her experience with a new puppy because, frankly, better her than me. This puppy, the one who has yet to be named, is not the only new arrival we need to talk about. I have one of my own, you know. 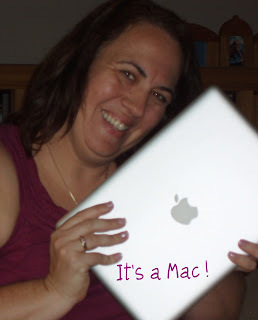 Once upon a time–about six years ago–I bought a laptop. It was very exciting; as a writer, this was HUGE, to be able to take my writing tool with me where ever I went, and I was also able to use it for my marketing work at the salon, so that was a bonus. It cost me a fortune; prices were still pretty high back then, no matter what you bought. I loved that thing. It weighed about 50 pounds*, but it was all mine. And then, after 2 years, the screen was fuzzing out. I’m not just talking about a little snow here or there; I’m talking about a full-on blizzard, the kind where you have to pull the car over and wait it out. There was something wrong in the hinge. I took it in to be diagnosed and was told that the repair, one year too late to be covered by the warranty (of course), would cost a whopping 80% of the original purchase price. Fuggedaboutit. I decided to pack it in and go without a laptop for a while. Shortly before my laptop died, we got a Mac at the salon. After learning the Mac ropes, I decided that my wait for a new laptop would have to be extended. I wasn’t going for a PC again; I fell in love with Mac. And Macs, well, they’re no cheap date if you know what I’m sayin’. And a couple of years ago, I started writing, A LOT. And then I started blogging. And then I started tweeting. And I have been in our basement, using the only computer in the house that has internet, and not in the room with my family very much. And then I started doing the Suburban WoW livestream. And then I decided that I had to take the plunge. Last week, I ordered a refurbished Macbook Pro, and it arrived today. **Yes, I really did do that. Can't wait to meet her and I love the gift message! Good Choice!! I LOVE my MacBook Pro. Her keyboard is so soft and … well, I call her "Luscious". And she's mine all mine. Haha and here we were wondering what that new additon could possibly be 🙂 Love your message to yourself. Enjoy! You certainly deserve it. 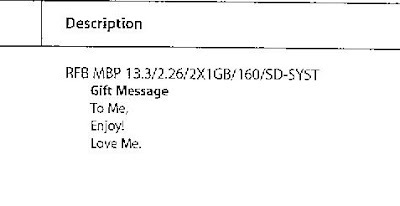 And here I thought I was the only one who left messages like that to myself, in online orders or e-mailed notes to myself, etc. Very, very jealous. I know you'll enjoy. Now we can be Mac sisters! Yay! Can't wait to figure out video talking with you! First CONGRATULATIONS on your mac! Second I"M SO FREAKING JEALOUS! Third, you've inspired me to save for one and I think this will be the first thing I buy with CASH! Not a credit card. Congrats. Once you go Mac…well you know the rest. CONGRATULATINOS!!! I'm so happy for you and Dad will be so jealous he wants a new laptop soooo bad. Oh, my neighbor Kim got a dog like that and she already had a lab. But the puppy is soooo cute. And they have 3 little boys 8yr. 7 and 5years. Oh Macs are so pretty and shiny! Congrats! It's all silvery like mine! We really should get the two lovelies together for a play date. If you have iChatAV we can telecon whenever we want. You go girl! You deserve it! Congrats on your new toy, glad it will help you spend more time with the family and enable your writing =). Macs and I do not get along, I was born and raised with PCs. I spent 4 years of high school tortured with Macs and definitely do not plan to go there again. I am contemplating a laptop, leaning towards HP or whatever brand/kind my computer nerd friend says is just as good but cheaper. Have to wait and make sure I can afford it, I refuse to put such a thing on credit. Of course in truth I don't put anything on credit, lol. Congrats! Three laptops later, I'm still waiting for my MacBook day to come – the next one will be for sure. My iMac is very excited to welcome her new cousin! FINALLY! A to me, from me gift is one of the best ever. Glad you got your Mac, it has been a great switch for me. And I absolutely love those Mac commercials. Previous post: Creative Parenting 101: Take A Picture. It’ll Last Longer!